Looking for a new heating system? There are more ways to heat your home now than there ever were before! Most homeowners across the U.S. choose to heat their home with a furnace system, but if this type of heating isn’t ideal for your space, our team offers a variety of other systems for your home. Finding the right system for your home can be a difficult process. It’s easy to feel overwhelmed by information on the internet. If you need a comprehensive guide to heating systems for your home, look no further. And if you want a great team to perform your residential heating services in St. Augustine then contact our team. Looking for a great way to heat your home? We provide three great heating systems. The furnace is one of the most used heating systems across the country. When we’re referring to a furnace, we’re referring to a forced-air heating system that heats through your ductwork. Most furnaces run on gas, but they can also use electricity or oil for power. Furnaces are a great system because they’re so efficient. Furnaces have a great AFUE (Annual Fuel Utilization Efficiency) rating. The average AFUE rating for a furnace is around 78-84% though they can be even higher. The higher the rating, the more heat the furnace can deliver relative to the amount of fuel consumed. 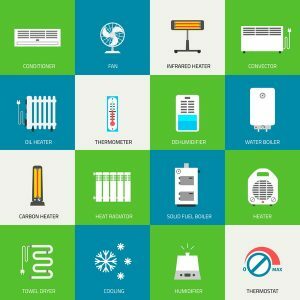 A heat pump is very similar to a standard split system air conditioner, what differentiates the two is a heat pumps ability to heat and cool. A heat pump has a component called a reversing valve which is a four-way valve that sits in the refrigerant line. This valve has the ability to change the direction that the refrigerant flows between the outdoor and indoor unit providing heating or cooling when you need it. Heat pumps are a great energy efficient alternative for your home too. Heat pumps save energy because they don’t generate heat like a furnace, instead, they simply move warm air from outdoors into your home. Heat pumps don’t perform well in freezing conditions, but they are still a great choice for our climate here in St. Augustine because we experience mild winters. Unlike a furnace or a heat pump, a ductless mini split system is, well, ductless. This system uses individual air handlers that run separately from all others. These units are great because they allow for customized heating (and cooling) in your home. Do you have a second story in your home that’s always hot but a first floor that’s freezing cold? Or maybe you’ve got one room in the back of your home that’s shaded by lots of trees but a room in the front of your home that receives a lot of natural light and always stays a few degrees warmer than the rest of the house. A ductless mini split system is a great way to alleviate these obstacles. If you’re looking for a great heating system, contact our team here at Climate Masters. We’ll have one of our professional technicians assess your home and match you with the right system. © 2013–2019 Climate Masters. All rights reserved.